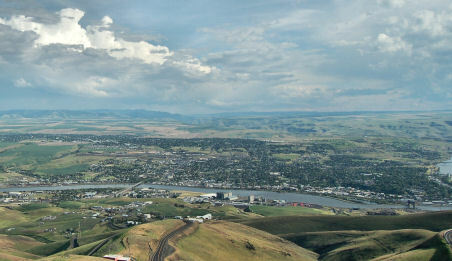 Lewiston, Idaho's strategic location on the Snake River, 80 miles north of Hells Canyon National Recreation Area makes the city a prime destination during the summer. This is the place to be for river rafting and kayak tours, since many of the hotels in this area feature Hells Canyon tour packages, and numerous river-rafting companies operate out of Lewiston. Tours can range from a half-day to several days in length and can also be scheduled on other Idaho and Washington rivers as well. City of Lewiston as viewed south from Lewiston Hill, US Highway 95. Lewiston is located at the confluence of the Clearwater River (left to right foreground) and the Snake River (far right) in north central Idaho. Lewiston also serves as a hub for fishing guides and outfitters. Its location at the confluence of the Snake and Clearwater rivers means that outdoor enthusiasts have ample opportunities to find that perfect location for steelhead, sturgeon, salmon and bass fishing. The Clearwater River is known for its steelhead, especially since the river is home to the world's largest steelhead hatchery. Other rivers in the area, such as the Salmon River south of Lewiston, are also known for their outstanding fishing opportunities. Lewiston's scenic beauty attracts nature lovers throughout the year, but particularly during the warmer months when the weather is at its prime. The city is stitched together by a series of nature trails, parks and interpretive markers. The trails offer a relaxing opportunity to learn about Lewis and Clark's historic visit to this valley area. The Nez Perce National Historical Park Visitor Center offers another view of the Lewis-Clark Valley's unusual history. Visitors can view Nez Perce artifacts at its museum approximately 10 miles east of Lewiston. The Nez Perce's history is explained through displays and a film outlining the tribe's several-thousand-year historical link with the Northwest.